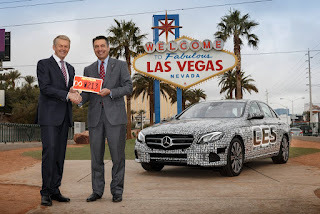 The Mercedes-Benz E-Class is the first-ever standard-production vehicle to be awarded with a test license for autonomous driving in the US state of Nevada, the carmaker revealed at the Consumer Electronics Show (CES) in Las Vegas. To allow autonomous driving functions to be tested, test vehicles had to be elaborately equipped with special hardware and software. However, on the E-Class, all it takes is a small software modification to the DRIVE PILOT control unit. Self-driving tests are permitted on all interstates and state highways in Nevada, human drivers being required only for turning, merging, and departing. The autonomous test drives in everyday traffic will be carried out by specially trained test drivers. Nevada Department of Motor Vehicles (NDMV) rules also stipulate that there must be one passenger behind the wheel and a second passenger in the vehicle on test drives. The test vehicles are identified by a red license plate reserved for autonomous driving. The production 2017 Mercedes-Benz E-Class will be unveiled at the North American International Auto Show (NAIAS) next week.